This is a guide to the “Carrier” method of introductions. Before it start its worth saying that this isn’t the only method of introducing rats that works, but in my (and many other owners) experience it is the most reliable and works in the broadest range of introductions. Its worth saying that when introducing rats I use this method as the core of what I do, but then may mix in elements of other methods if the situation calls for it (say free ranging with them together occasionally first if it doesn’t appear to aggravate the rats). Why: A smaller space means less area for a rat to control/defend (so dominance does not need to be pushed as far). The smaller space means rats avoid each other less (so resolving hierarchy disputes quicker). A small space also means there is less room to run away (reducing the chance of injury as most introduction related injuries occur when a rat runs from a confrontation and is grabbed). The rats are allowed and encouraged to work out their hierarchy as quickly as possible to cut down on the length of time they are stressed for. Weaknesses: Its weaknesses are with rats that are very aggressive/territorial who may cause injury to others during introductions or where you have a particularly ill/weak rat that is being introduced to potentially active and rough rats. It may also be difficult where you have a group of rats that all actively avoid confrontation but are not ready to become friends (leading to permanent stalemate). In some cases a rat who has been on its own for some time and lost the ability to ‘speak rat’ may also struggle more, in these situations play it by feel and consider mixing in some other introduction techniques. Hints and Tips: Make sure you scatter feed food at this stage, as it helps rats move around together and mingle. Depending on the length of time try and avoid free ranging, especially in a large area, a bit of out time in a small neutral space for a short time each day works fine for longer introductions. 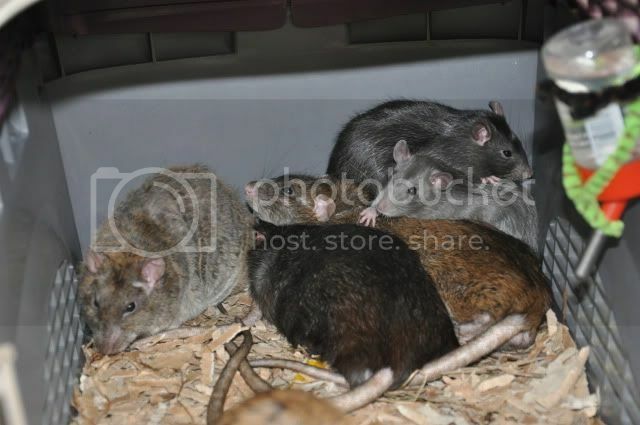 Don’t add enclosed beds like igloos and cubes and avoid tubes until the rats are in their big cage and very settled. Dead ends lead to cornered rats which can lead to avoidance, excessive defensiveness or even nasty fights. If you are struggling with them in the first small space try taking the carrier/cage someone completely new smelling, such as in the car on a drive, or outside if it’s warm, or even a friend’s house. This can distract them and encourage them to bond together against the common scariness. In some cases starting in a neutral space may not work for your rats and you may be better off going straight into the carrier. 1. 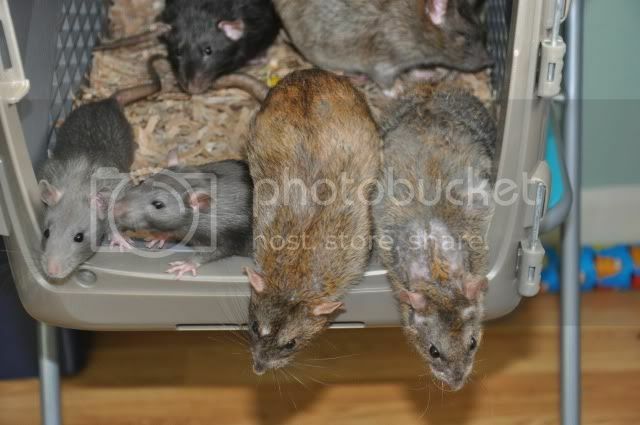 Get a small cage or carrier, making sure that it is small enough so that when the rats lie down they are forced to be close together but with enough space to add a water source. The size of your group will define how big this is. Ideally it should have more floor space than height, as scared rats often flee upwards to hide. I use a large cat carrier for this for around 4 to 6 rats, with not much height and enough floor room for a bit of movement - but not room to run away and hide. You can either have your carrier/intro cage completely clean and unfamiliar or have it smelling of the expected dominant rats, which will help them feel more secure and so calmer. However for some rats, if they see a space as 'theirs' they may be more likely to defend it, so watch the rats and judge which you think is best. Make sure that it is empty of everything except for a water bottle - or ideally two. You can scatter a little bit of food around to distract the adults but don’t put it in a bowl as this may be defended, or any cage furniture such as hammocks. Ideally cover the floor with a loose substrate or litter, rather than a towel or fleece, as this can be used to hide under and avoid confrontation. 2, Take the carrier and rats into a room that the rats don’t normally free range in which has a small neutral rat safe space in it (table top, couch, bed or bath with a towel down to prevent too much slipping) and add the rats to this neutral space. Where you have a strong, confident Alpha, add them and the newcomers first. Once he is settled then add the calmest rat in your group, going from those you think will be the easiest to intro, to those you think will be hardest, one rat at a time. This doesn’t overwhelm the newcomers as quickly and also with the Alpha being happy with them to start with he will often intervene if any following rat takes things too far. If you don’t have a strong alpha, or the alpha is over the top start with a calm member of the pack then add the alpha. The key with this step is not to intervene unless absolutely necessary, so when the rats are in danger of being injured or already are. Fighting and scuffles are normal, you should expect pinning and some chasing around and maybe some boxing. You should also expect squeaks and pitiful wails, let them do this, interrupting them will stop them working out whose boss. Look out for the truly aggressive poofing up (hedgehog impression) or sideling (walking sideways towards the other rat, head lowered, possibly tail swishing or chomping his teeth), this is overly aggressive behaviour and can be an indication they plan to bite, don’t separate straight away, try distraction with a loud noise or blowing on them to break their concentration. The idea is to prevent any damage but not stop perfectly natural battles which will let them know there position in the hierarchy, the general rule of ‘No Blood, No Foul’ is a good one to bear in mind. Once things have quieted down and the existing rats are ignoring them (at this stage the weakest or newest rats are probably cowering in the corner) then add another rat, and so on, once they are all added move on to the next step. Note: This behaviour may, and probably will, occur at any step of the process, the same rules apply. 3, Next add the carrier to this space with the door wide open and let them go in and out freely before finally closing the door when things are going well. If you hear squeaking don’t intervene. If you hear bangs don’t intervene (but maybe check and make sure your around). If you hear proper screams (these are very different to squeaks, long and drawn out and very loud) then you need to make a loud noise, spray them with a water bottle or separate with a towel, but only if it looks as though the weaker rats are actually being attacked. Some rats can be very vocal! A bit of fur being pulled out is not something to worry about, blood is not - and this is a point to separate them. What you should see initially is the stronger or older rat going over to sniff the weaker or newcomers and the other rats may well be interested in him too. At some point your exisiting rat will get a bit rough with them and they will try to run away. This will lead to your rat chasing and grabbing the weaker or younger rat by the scruff or bum, but with limited space this shouldn’t result in injuries (hence why this method generally results in less injuries than more open intros). The rat will then probably fluff up and try and pin or flip the weaker rat, they will squeak and struggle (and make you feel cruel and evil). Expect him to furiously groom them - ideally you want them to submit and be still and the small space is to give them nowhere to escape to, so that they have no choice but to give in - when they do he should relax and let them go. He shouldn’t relentlessly pursue them or be constantly pouncing on them, though he may pin them a few times or sit on them for a while. The new rats may become overly defensive, freezing in a corner stood up pushing noses away or threatening to bite there new neighbours often making the other rat reluctant to approach (creating a stand-off), if this last for more than an hour then try taking them out for a drive or a walk in the carrier, this should encourage the new rats to seek comfort from there cagemates and bond. 4. Once things have settled down and everyone sleeping together leave them in the carrier for at least an hour, possibly overnight if it has taken a while to get to this point. Try to relax and breathe a bit! Stay within hearing range but maybe leave the room, as I am sure that rats can pick up on our worry. There may be the odd 'war' again, with squeaks and bumps when you should go back in and check them, but don’t be tempted to split them up unless it’s serious. They will probably have to put the kittens in their place a few more times over the next day or two before peace reigns. This stage can take an hour, or it can take a few days. Times vary a lot depending on the rats. 5. Once things have been settled in the carrier for a while then you can think about moving them into a cage. If you have a big cage then make it smaller or try and find an intermediate cage. I do introductions first in the carrier, then a Ferplast Mary sized cage, then in half my big cage, (SRS – which usually fits 12 in) before moving to the full cage. Start with it completely bare, apart from 2 + water sources. Transfer some of the substrate / bedding from the carrier and add the rats (this helps make the area smell of both of them, and of territory already fought over and resolved). I normally add the lowest ranking rats first at this stage, then the most established rats. 6. The same applies as when they are in the carrier: expect renewed tension and more pinning and squeaking. You will need to watch them until it calms down, then feel free to leave the room but stay in hearing distance (try not to hover around the door - I have been guilty of that one more than once). After a few hours with no fighting they are probably sorted, though there may be the odd scuffle for a few days. 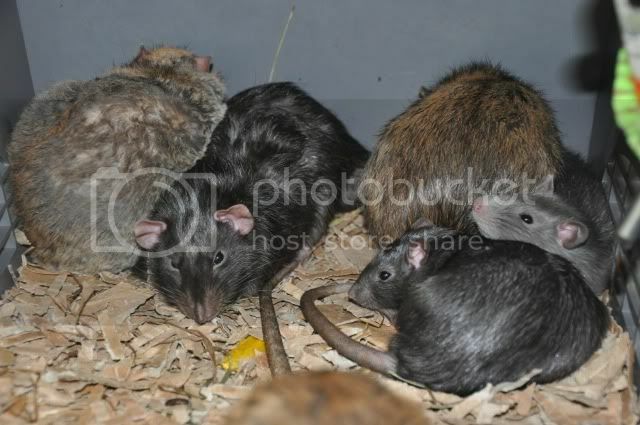 Once you see them routinely sleeping together, or even better in mixed groups (so one newcomer with one or two existing rats, and another with others) then it’s done and you can liven up the cage (adding first 1 open sleeping place such as a hammock, then maybe a wheel, some branches etc., don’t use enclosed beds for some time). Next you can make the space bigger again or move into a bigger cage. It often takes a week or two to reach this point and don’t be afraid of taking a backwards step if they refuse to settle at the next stage. 7. In terms of free range when this is going on, leave them together for at least the first 24 hours uninterrupted. After this you can spend time with them but try to do this with the whole group, or in mixed smaller groups (so a new rat and 1 or 2 existing rats) and keep it in an enclosed space, don’t be tempted to free range in normal or large free range area’s until the group is fully settled. Often this can spark of new confrontations if they haven’t fully bonded and established the hierarchy yet. Also if you have a couple of rats who are not bonding or very wary around each other try putting them in the smallest carrier you have together. This changes the dynamics and can often break down barriers and build up individual relationships. Here are a few pictures from a carrier introduction. The new lads are the blue and black topeared babies, Luke and Limi.